The large number of model boats and reliefs illustrate the deep bond which connected the Egyptians with the life-giving waters of the Nile.Grain and fruit were laid in the tomb while the mummy was adorned with floral wreaths. 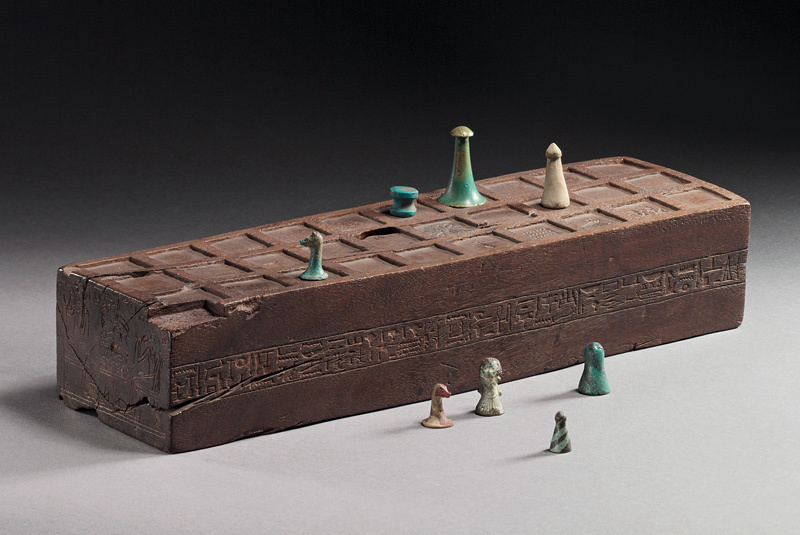 Small figurines show the manifold variety of animals such as the hippopotamus, ape, dog, shrew and hedgehog in Egypt. Inv.-No. 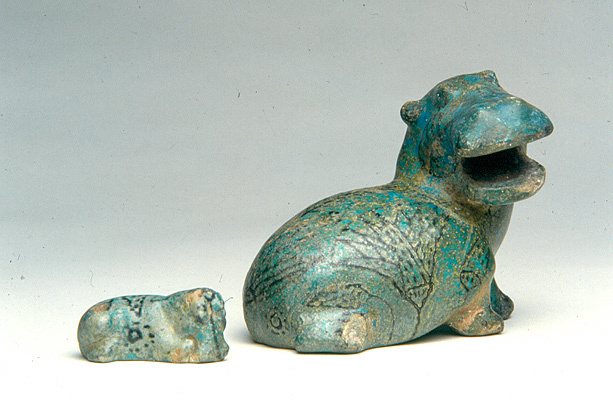 ÄM 13892, 13890 Amongst the numerous faience figurines of the Middle kingdom varying in colour from dark to light green and blue, the small hippopotamus figurines have a special position. The animal was represented very realistically and the plants, such as water lilies, papyrus and lotus plants, representing the environment in which they lived, were painted on their bodies. The main theme depicted on the Egyptian tombs is agricultural work, but hunting and fauna are other popular subjects. The reliefs gain in forcefulness through the narrative episodes e.g. the weary farmer who has fallen asleep under a tree, and by the characterisation of the features of individuals: workers, in contrast to the tomb owner, do not wear wigs but are close-cropped or unkempt. The Syrian palace guard is seen drinking his beer in a most unusual way, through a straw. Inv.-No. 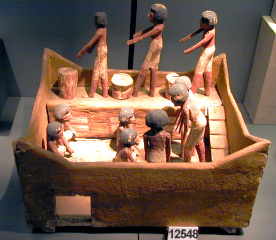 ÄM 12548 At the beginning of the Middle Kingdom (2000-1640 B.C.) wall decoration in the graves is replaced by 3-dimensional models. 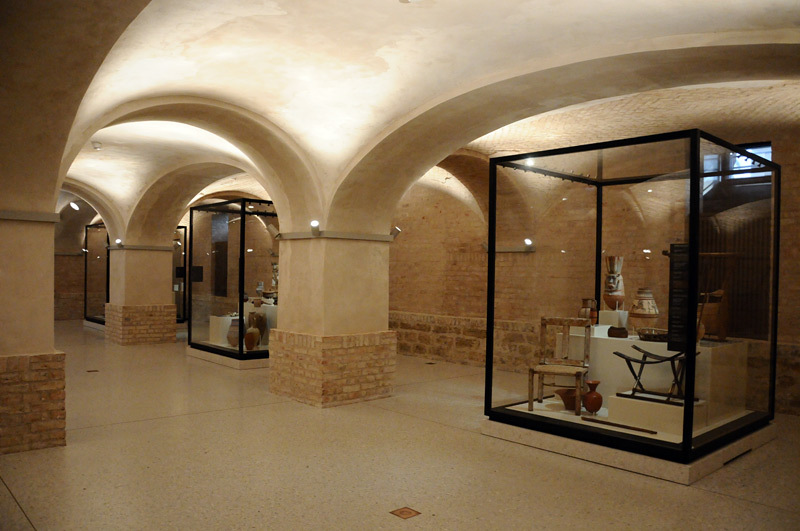 They had the same function as previously the relief decorations in the chapels: They were there to secure the deceased continuous supplies and existence in the afterworld. The model of the silo secured the deceased availability of corn throughout all eternity. Since food was also considered essential in the hereafter foodstuffs and the farming implements were placed in the grave. 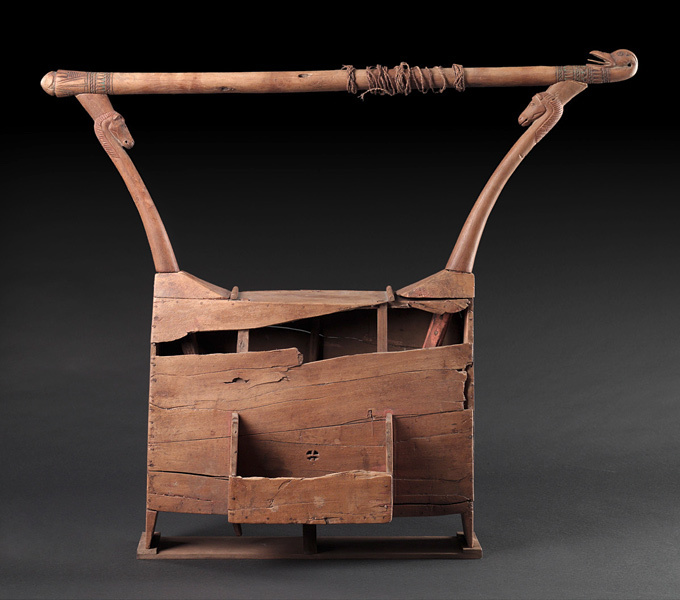 Small wooden models show the ongoing work, forms of kitchen utensils, storage containers, jars and jugs give clues use. 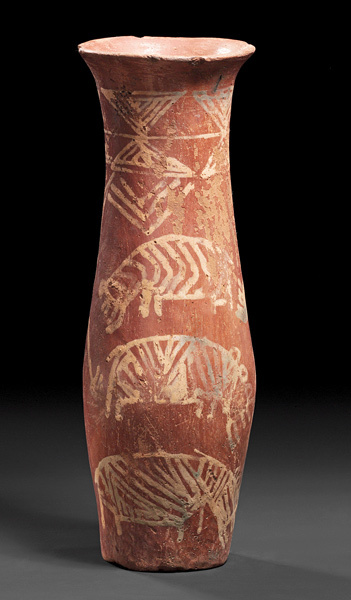 Plain vessels were used for water and beer while vessels used to hold wine were often painted with floral motifs. To pass the time various musical instruments such as the lyre, oboe, harp or lute, as well as board games were available.Women as well as men used cosmetics and wore jewellery. Inv.-No. ÄM 10247 Der Kasten dient als Resonanzboden, die Saiten gingen vom waagerechten Stab zum Vorbau. Die beiden Vertikalstäbe sind mit Pferdeköpfen, der Horizontalstab mit einem Entenkopf und einer Blume verziert. Inv.-No. ÄM 10756 Das kastenförmige Brettspiel ist auf der Oberseite in dreimal zehn Felder, auf der Unterseite in vier, zehn und vier Felder eingeteilt. Auf der Oberseite sind vier Felder der einen Außenreihe mit hieroglyphischen Vermerken versehen: zwei sitzende Männer, drei Ba-Vögel, die Hieroglyphe für 'Wasser' und die Hieroglyphe für 'gut'. Ein mittleres Feld der Mittelreihe trägt eine Rosette. 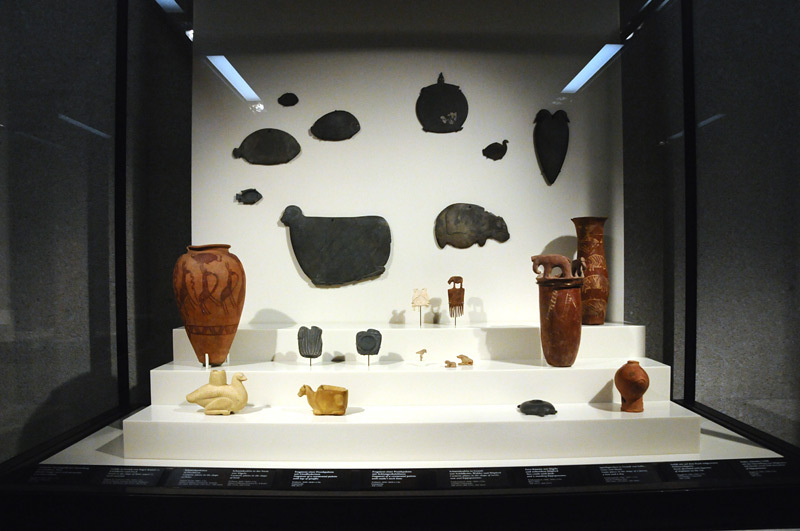 Stone artefacts, pottery and jewellery dating to the 4th millennium BC - bear witness to an age of technological progress.The pictures decorating the Nagada vases illustrate the world view of the early Nile Valley inhabitants. The animal sculptures fashioned of hard stone depict divine powers which retained their animal forms also historical times. Inv.-No. ÄM 23222 Auf dem Gefäßkörper sind in dicker gelber Farbe drei übereinander stehende Tiere gemalt, die durch ihre plumpen Körper mit kurzen Schwänzchen, ihren dicken Kopf mit kurzen, ösenartig wiedergegebenen Ohren als Nilpferde gekennzeichnet sind. Das obere Tier geht nach links, die beiden unteren nach rechts. Rechts neben den Nilpferden folgt eine von oben dargestellte Eidechse, die den Topf herabzulaufen scheint; mit dem Maul berührt sie fast das untere Ende.